We will be using the same major version of Blackboard as we do currently, updating from Blackboard 9.1 version 3200 to Blackboard 9.1 version 3300. No major changes to Blackboard’s navigation or tools will occur, but the following enhancements will be added. Instructors will be able to manage the availability of a course through an icon on the course’s Home module page. This tool is an addition to existing course availability management tools, such as Qwickly. The Grade Center’s Column Organization tool will allow you to select and delete multiple columns at once. However, assessments linked to a course menu can only be cleared using this tool. An assessment must be deleted from the course menu before its column can be deleted. Discussion participants will see a “Replies to Me” counter icon when viewing a forum. This feature displays the number of replies added to a participant’s thread. The participant can view replies by clicking on the “Replies to Me” icon. If the instructor has sorted forums alphabetically, a “Remove Sorting” button will appear. Clicking this button will undo the sorting and allow the instructor to click and drag forums into a desired order. Crocodocs will reach the end of its life and will be replaced by a comparable preview and annotation tool called Box View by January 8th, 2018. MATC must take the update to Box View to maintain the availability of Inline Grading to our faculty and students. To learn more about this change, see our guide. Annotations added to documents using Crocodocs prior to the Box View conversion will be preserved, but will be read-only. An “Access Denied” error will no longer display to guests when viewing a course’s Announcements page. Changes to the order of course menu items stay in position after page is refreshed or navigation to a different page. An error generating an “Unknown Sender” message in the Course Messages tool is resolved in this update. An error preventing discussion board subscription notifications from being sent to subscribers is resolved in this update. The Grade Center’s email tool sends attached files with correct file extensions. The Retention Center now displays risk markers aligned within table cells. In order to maintain a high level of continuous service, MATC-Distance Learning in conjunction with the Information Technology Department, have decided to migrate the entire Blackboard learning management system to a hosted solution with Blackboard. The migration will take place beginning May 25th and continue through May 29th. This means that no one will have access to Blackboard during this time. All students and faculty will need to logoff Blackboard by 11:59 pm on May 24th. We anticipate the LMS being available on Monday May 30th, however we will be conducting testing during the week of May 30th. 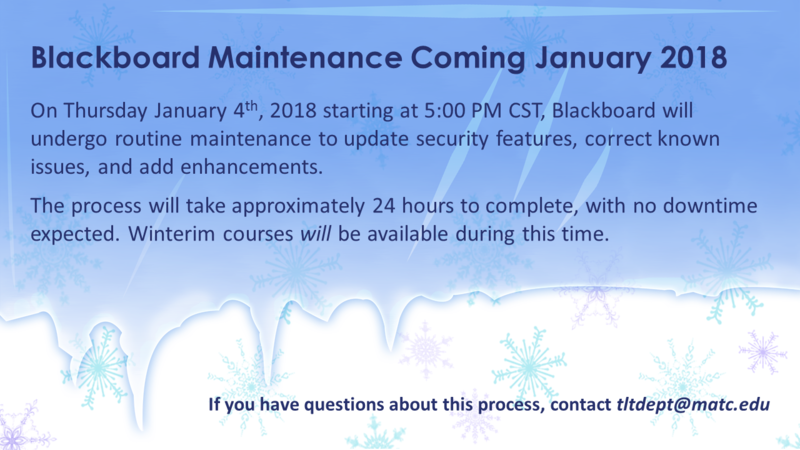 When Blackboard comes back on-line, we will be at a newer version however there is minimal front-end change impacting students and faculty. The Distance Learning team is working on reviewing any changes that will effect faculty and/or students and will communicate those changes to the groups prior to the migration. For additional information about the upgrade, please see our Upgrade FAQs Spreadsheet. Thank you for your patience as we continuously strive to provide quality educational technology products.